Sewage sludge ash is the by-product produced during the combustion of dewatered sewage sludge in an incinerator. Sewage sludge ash is primarily a silty material with some sand-size particles. The specific size range and properties of the sludge ash depend to a great extent on the type of incineration system and the chemical additives introduced in the wastewater treatment process. At present, two major incineration systems, multiple hearth and fluidized bed, are employed in the United States. Approximately 80 percent of the incinerators used in the United States are multiple hearth incinerators. Figure 1 shows a simplified flow diagram of a sludge incinerator. The complete system includes sludge pretreatment operations such as sludge thickening (sedimentation) and sludge dewatering (vacuum filter, centrifuge, or filter press), followed by incineration, air pollution control, and ash handling. Sludge dewatering may involve the addition of ferrous chloride, lime, or organic polymers to enhance the dewatering process. Auxiliary fuel is normally needed to maintain the combustion process. (2) The quantity of auxiliary fuel required depends on the heating value of the sludge solids and, primarily, on the moisture content of the incoming feed sludge. Figure 1: Simplified sludge incinerator flow diagram. Most of the sludge ash generated in the United States is presently landfilled. Sludge ash can be obtained directly from municipal wastewater treatment facilities with sludge incinerators or from private companies responsible for the disposal of the sludge ash. Due to the relatively small quantities of sludge ash generated, provisions for ash storage will be required to accumulate sufficient amounts for most applications. Sludge ash properties (chemical) depend on the nature of the wastewater and the chemicals used in the treatment and sludge handling and incineration process. Since sludge is almost always dewatered prior to combustion, pretreatment of the sludge to enhance the dewatering process may include the addition of ferrous salts, lime, organics, and polymers. Ash produced at treatment plants that introduce ferrous salts or lime for sludge conditioning and dewatering contain significantly higher quantities of ferrous and calcium, respectively, than plants that do not. The pH of sludge ash can vary between values 6 and 12, but sludge ash is generally alkaline. Sludge ash from multiple hearth incinerators will usually consist primarily of silty material mixed with some larger sand-sized particles. The formation of larger particles is normally the result of higher operating temperatures and the formation of clinkers. Fluidized bed furnaces produce only a very fine (silt-sized) ash. Table 1 presents physical property characterization data for sludge ash from several sources. Sludge ash is a silty-sandy material. A relatively large fraction of the particles (up to 90 percent in some ashes) are less than 0.075 mm (No. 200 sieve) in size. Sludge ash has a relatively low organic and moisture content. Permeability and bulk specific gravity properties are not unlike those of a natural inorganic silt. Sludge ash is a nonplastic material. Sludge ash consists primarily of silica, iron and calcium. The composition of the ash can vary significantly as previously noted, and depends in great part on the additives introduced in the sludge conditioning operation. There are no specific data available relative to the pozzolanic or cementitious properties of sludge ash, but sludge ash is not expected to exhibit any measurable pozzolanic or cementitious activity. Table 2 lists the range of major elemental concentrations present in sludge ash reported from two sources. Table 1. Typical physical properties of sewage sludge ash. Table 2. Typical range of elemental concentrations in sewage sludge ash. Foisy, B. F., L. I. Ramon, et al. "Sewage Sludge Incineration: Meeting Air Emissions in the Nineties and Beyond," Proceedings of the National Waste Processing Conference, ASME, 1994. Modern Pollution Control Technology. Volume II, Research and Education Association, New York, 1980. Environment Canada. Utilization of Ash from Incineration of Municipal Sewage Sludge - Draft Literature Review, Wastewater Technology Centre, November, 1992. Lue-Hing, C. "Sludge Management Costs Going Up," Resource Recovery, 1989. Metropolitan Council of Twin Cities Area. Analysis of Sludge Ash for Use in Asphalt, Concrete, Fertilizer and Other Products. Publication No. 12-82-103, October, 1982. Metropolitan Waste Control Commission. Sewage Sludge Ash Use in Bituminous Paving. Minnesota Department of Transportation, Minnesota Pollution Control Agency, October, 1990. California Integrated Waste Management Board. Summary Report: Appropriate Level of Regulatory Control for Sludge Ash and Contaminated Soil, April, 1995. Tay, Joo-Hwa. "Bricks Manufactured from Sludge," Journal of Environmental Engineering, Vol. 113, No. 2, 1987. Micale, F. J. A Mechanism for Ash Assisted Sludge Dewatering. USEPA, EPA-600/2-76-297, 1976. Wegman, D. E. and D. S. Young. "Testing and Evaluating Sewage Sludge Ash in Asphalt Paving Mixtures," Presented at the 67th Annual Transportation Research Board Meeting, Washington, DC, January, 1988. Khanbiluardi, R. M. Ash Use from Suffolk County Wastewater Treatment Plant, Sewer District No. 3. City University of New York, Draft Report, August, 1994. Chesner, W. "Waste Glass and Sewage Sludge Frit Use in Asphalt Pavements," Utilization of Waste Materials in Civil Engineering Construction.American Society of Civil Engineers, September, 1992. Braun Intertec Environmental.Sewage Sludge Ash Use in Bituminous Paving, Report on Additional Testing. Prepared for Metropolitan Waste Control Commission, 1991. Braun Intertec Environmental. Sewage Sludge Ash Use in Bituminous Paving, Report on Additional Testing, Prepared for Metropolitan Waste Control Commission, 1992. Gray, D. H. and C. Penessis. "Engineering Properties of Sludge Ash," Journal of Water Pollution Control Federation, Vol. 44, No. 5, May, 1972. Minnesota Department of Transportation. Testing and Evaluating Sewage Sludge Ash in Asphalt Paving Mixtures, March, 1984. Sewage sludge ash can be used as a mineral filler substitute or as a portion of the fine aggregate in hot mix asphalt paving. The introduction of sewage sludge ash at levels of approximately 2 to 5 percent by weight of aggregate has been shown to produce mix design properties that are comparable to those of mixes containing conventional fillers such as hydrated lime and stone dust. During the past 15 years a number of laboratory investigations have been undertaken, and field demonstration pavements have been constructed, using sludge ash that has been incorporated into hot mix asphalt as either a mineral filler or as fine aggregate substitute. 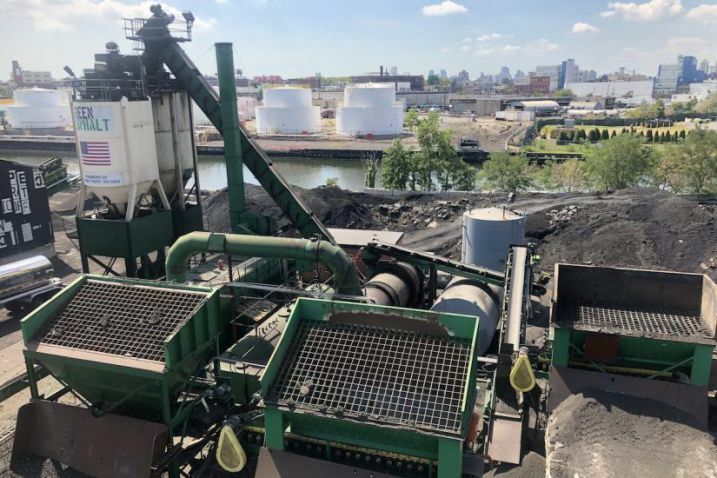 Although data from these bench scale tests and field installations suggest that asphalt mixes containing sludge ash can readily be prepared and should perform in an acceptable manner, there is no widespread commercial use of this material in the United States at this time. Table 3. Listing of Minnesota test pavements. In 1993, the Suffolk County, New York, Department of Public Works constructed test pads containing sludge ash that was introduced into a New York State Department of Transportation surface mix as a sand substitute. (2) The prepared mixes contained a total of 5.5 percent sludge ash by weight, which accounted for a replacement of 15 percent of the sand or fine aggregate fraction of the mix. Testing of the test pad focused on the surficial texture (skid resistance and surface runoff properties of the ash mixes). Control mix test patches (without ash) were also constructed, and test results of the control mix test patches were compared to the sludge amended mixes. The results provided data that indicated that the presence of ash had no significant effect on the skid resistance of the pavement and was comparable to the control mix. Previous testing and field demonstration data suggest that sludge ash can be introduced as either a mineral filler or as both a fine aggregate substitute and a mineral filler into an asphalt concrete mix. The specification requirements for mineral filler covered in AASHTO M17-83,(3) and listed in Table 4, require that 100 percent of the mineral filler must pass the 0.6 mm (No. 30) sieve. To comply with this specification, some sludge ash sources may require crushing and/or screening to remove oversize particles. If used as a combination mineral filler and fine aggregate substitute, no processing will generally be required. 0.60 mm (No. 30) 100 Mineral filler must be free from any organic impurities Mineral filler must have plasticity index not greater than 4. There are several plants located in Japan that vitrify sewage sludge ash. A recently closed facility operated for several years in Monticello, New York, producing a frit-like aggregate that was suitable for use as a fine aggregate substitute material,(4) and was approved for such use by the New York State Department of Transportation. Vitrification produces a fine aggregate material (not a mineral filler), which permits the introduction of higher percentages of sludge ash into a mix. Some of the properties of sludge ash that are of particular interest when sludge ash is used in asphalt concrete include particle size, plasticity, and organic content. 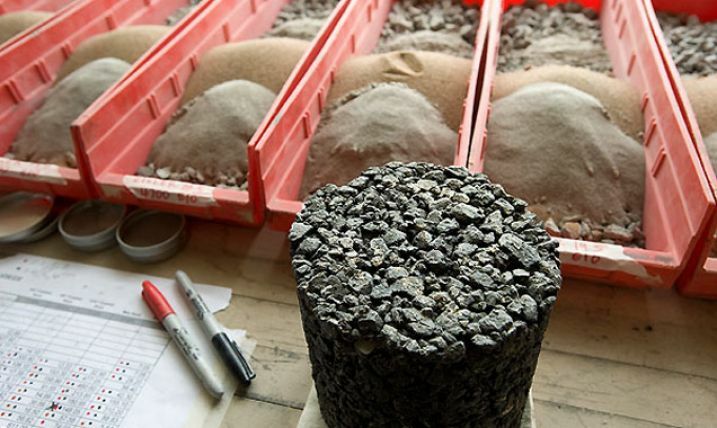 Plasticity: Sludge ash is a nonplastic material and meets the plasticity requirements for mineral filler or fine aggregate outlined in AASHTO M17(3) and AASHTO M29,(5) respectively. Organic Impurities: Sludge ash can be expected to contain some small percentage (generally less than 2 percent) of organic material, depending on the efficiency of combustion. (6) This small organic fraction does not appear to affect the performance of sludge ash as a mineral filler. The properties of an asphalt paving mix containing sludge ash that are of particular interest include stability, mix density, air voids, asphalt demand, durability, and asphalt cement viscosity. Although sludge ash can essentially meet the requirements of a mineral filler, as outlined in AASHTO M17, it is likely that when introduced into a paving mix, some of the larger sludge ash particles act as a mineral aggregate material (filling the interstices between coarser aggregate materials). At the same time the silt-sized particles act as an asphalt modifier, forming a high-consistency asphalt grade binder. A high-consistency asphalt grade binder exhibits relatively high viscosity and hardness and low ductility, which could increase the susceptibility of the pavement to thermal cracking. Asphalt mixes containing sludge ash can be designed using standard laboratory procedures. Conventional AASHTO pavement structural design methods are appropriate for asphalt pavements incorporating sludge ash as a mineral filler or fine aggregate. Sludge ash is a porous, lightweight material that must be introduced into a mineral filler storage silo pneumatically. Due to its lightweight nature, additional silo storage capacity may be required. Wet sludge ash that has been quenched as part of the sludge incineration process cannot be managed in this manner. Sludge ash may be introduced into paving mixes by means of its own hopper or through a mineral filler silo. The same methods and equipment used for mixing, placing, and compacting conventional pavements are applicable to asphalt pavements containing sewage sludge ash. There has been some concern expressed regarding the presence of trace metals in sludge ash. Recent studies in Minnesota(10,11) indicate that leaching does not appear to be a problem, which would seem apparent due to the small percentages of sludge ash actually incorporated into a mix (less than 5 percent). Nonetheless, environmental criteria are needed to establish acceptable sludge ash trace metal content criteria. Additional data are also needed to define specifications regarding acceptable loss on ignition or organic impurity data. Sewage Sludge Ash Use in Bituminous Paving, Report to Legislative Commission on Waste Management, Minnesota DOT, Minnesota Pollution Control Agency, Metropolitan Waste Control Commission, October, 1990. Khanbiluardi, R. M. Ash Use from Suffolk County Wastewater Treatment Plant Sewer District No. 3. City University of New York, Draft Report, August, 1994. American Association of State Highway and Transportation Officials. Standard Method of Test, "Fine Aggregate for Bituminous Paving Mixture," AASHTO Designation M29-88. Braun Intertec Environmental. Sewage Sludge Ash Use in Bituminous Paving: Report on Additional Testing. Prepared for Metropolitan Waste Control Commission, 1991. Braun Intertec Environmental. Sewage Sludge Ash Use in Bituminous Paving: Report on Additional Testing. Prepared for Metropolitan Waste Control Commission, 1992.